*I received product and/or payment for my post about BeddingStyle.com. All opinions are 100% my very own. I’m one of those people who prefer comforters over other type of bedding. I love quilts for the colors and patterns but not for the weight. That’s why for me a comforter is well more comfortable. I recently added this new NAUTICA comforter to our bed and thought it would be a great time for a master bedroom refresh. 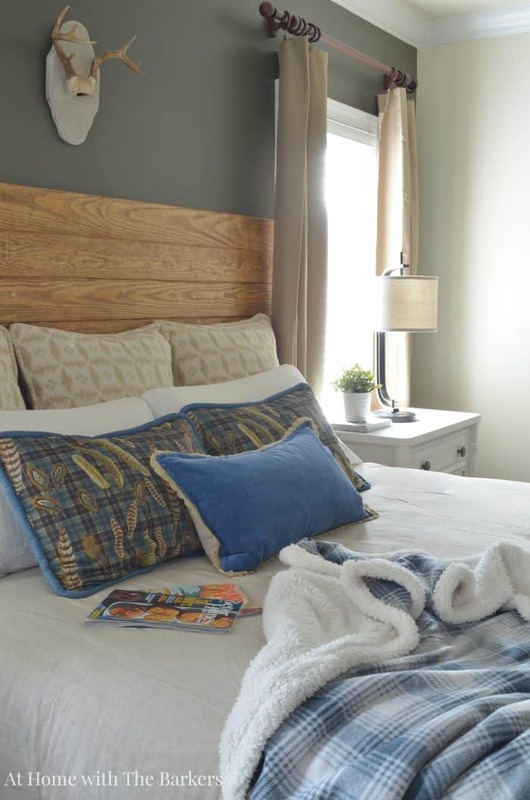 Lately, I have been changing my mind between colorful versus neutral rooms and that was the case in my master bedroom as well. 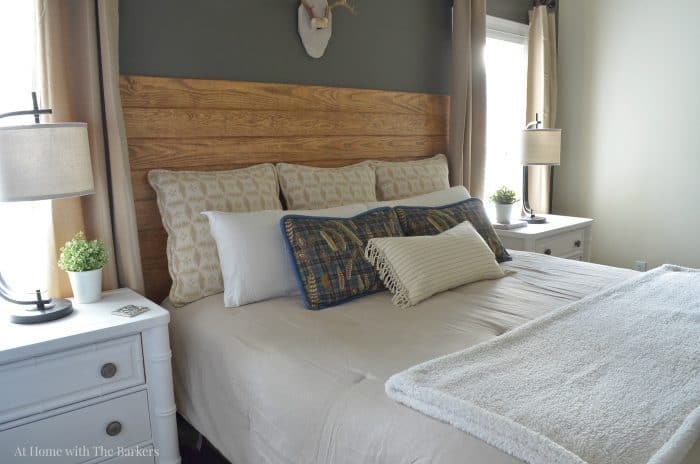 I chose the comforter in khaki and I thought it would be great to show you how changing around the pillows is much easier with a neutral base. For now I am using blue as my accent but I have a feeling I will be changing that too. I’m working on something really fun to add to the blog and I can’t wait to share that secret with you! Earlier this year we added the DIY headboard and I painted the night stands Scandinavian pink. While I still love the headboard I was finding it difficult to decorate around the pink. I knew the best way to change out my look would be to create a room where all of the big, important pieces are neutral. I painted over the pink on the night stands going with white. I decided to try the new One Step Paint from Amy Howard…I’ll do a blog post on that soon to let you know what I thought. 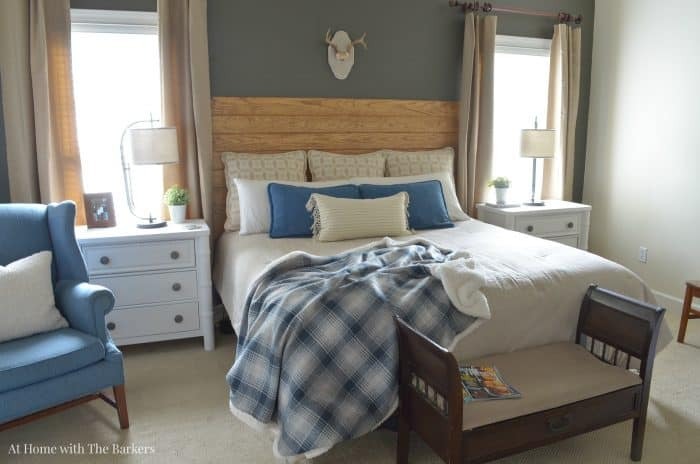 That gorgeous Eddie Bauer plaid and sherpa throw blanket was also from BeddingStyle.com and I love it. It is so cozy. Here’s where I would love your input…bedskirt or not? If so, what style? I already have a bleached drop cloth that I was thinking of using for it but I’d love your ideas. 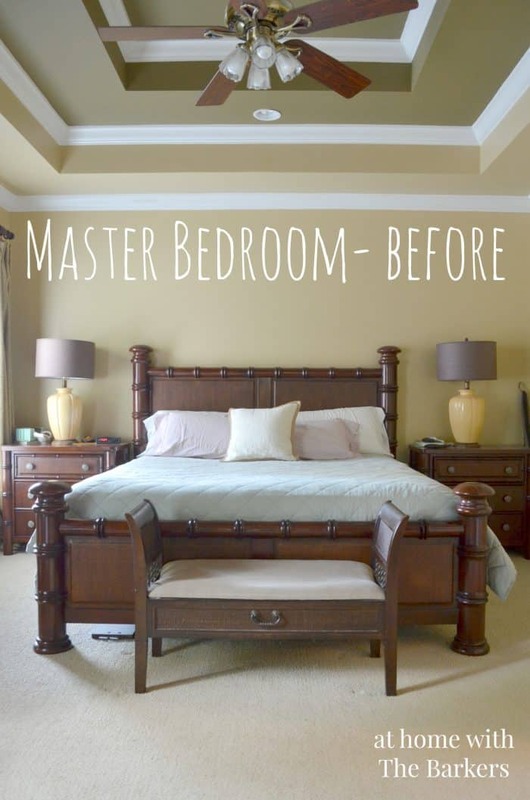 Just in case you’re like me and like to see rooms evolve…Master Bedroom a year ago. 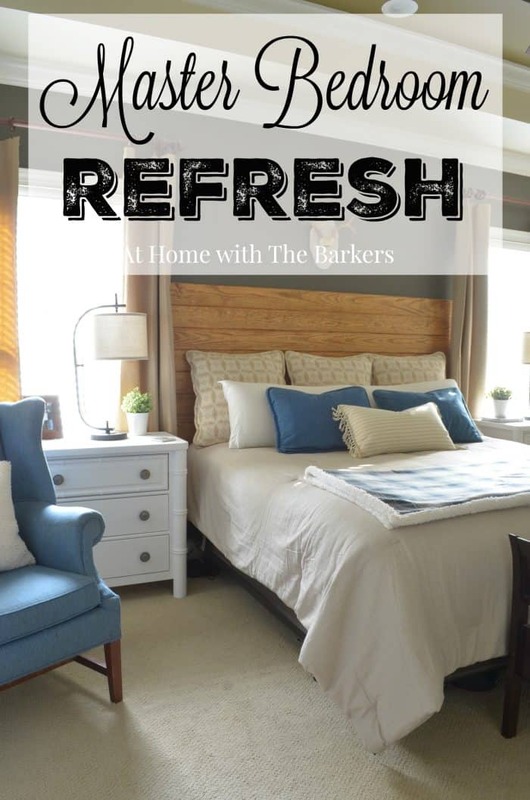 Love your refresh 🙂 so perfect for a relaxing and beautiful space! Thank you Debbie! It really is a nice place to be. 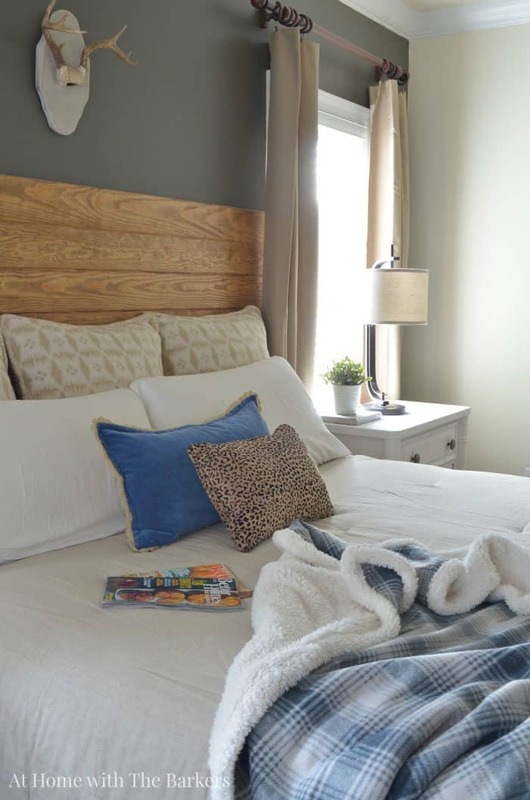 You asked for comments re the bedskirt…don’t do it, the bed/bedroom looks great the way it is! You have been busy with your beautiful home with all the changes and it looks wonderful. The refresh looks great! That blanket looks super cozy. I am beginning a small refresh of our bedroom and am looking for a new comforter or thin quilt. I really like the neutral one you selected so I will check it out! I keep going back and forth on a bedskirt as well. I’ve gone without during the summer but am thinking I’ll put one back on for winter. And did I mention how much I like that blue plaid sherpa throw? COZY! Love the headboard!!!! The blanket is perfect. Nice job, Sonya! Such a cozy space! 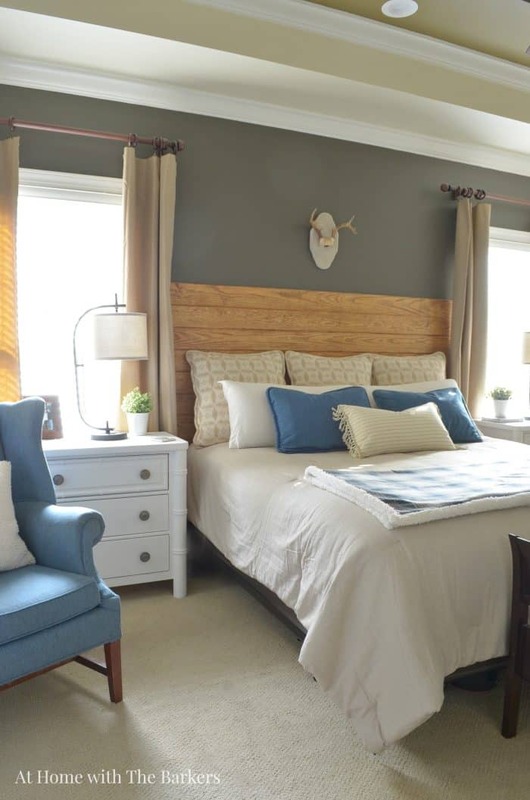 Thanks Julie…that headboard is a favorite of mine too! Love the refresh! Wanting to start one in our master. The throw is so pretty! Thanks Christy! That throw is the best, everyone loves it. Love it! It’s light, airy and comfy! Comfy bedroom is a must for me Malia! Thanks for stopping by. Love this bedding! You room looks so cozy and comfy! Beautiful, Sonya! I love the new bedding – looks so cozy and comfy! Where did you get your curtains? Nice neutral curtains have been tough to settle on! These look great!